If you love science fiction and have children, you are well aware of the gross lack of quality, live-action programming suitable for children - especially children of color. Yes, there are many animated projects to be found. Still all children, like adults, deserve to see flesh-and-blood reflections of themselves onscreen. The most recent child-focused project I can recall was the 2007 Doctor Who spinoff The Sarah Jane Adventures, starring the late, great Elizabeth Sladen. Yet even that series had situations that would have been too intense for most children under 10. 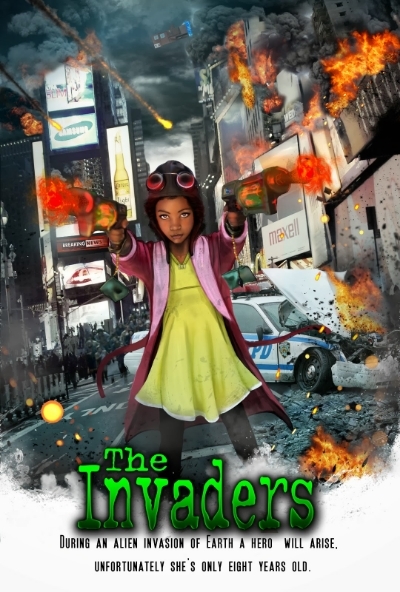 Thank goodness for The Invaders, a whimsical sci-fi web series chronicling the adventures of young Angie Martinez (Catori Crawford). Angie Martinez is a bright, inquisitive eight-year old girl who posts video blogs about her daily adventures to her YouTube channel, The Angie Show. One night during a severe thunderstorm, Angie, and her faithful sidekick Mr. Snuggles the teddy bear, witness the arrival of a very real UFO. When Angie goes to investigate, she unwittingly embarks on the adventure of a lifetime! Created by Mark Cabaroy, The Invaders is a terrific web series for both the young and young-at-heart. Young Catori Crawford as Angie is charming and precocious. The aliens will definitely get more than they bargained for in their encounters with our young hero! Another highlight of the series is its storytelling device. We experience what Angie does through her video diary. This form of narration is effective because it doesn't condescend to children, it engages them. Angie is someone they can readily identify with. On the technical side, the production features crisp cinematography with very impressive visual effects. Another wise choice is the producers have kept each episode under three minutes in length - perfect for engaging the notorious short attention spans of its target demographic. The Invaders gets a grade of A+ from this viewer. As of this writing, 14 out of 25 planned episodes are now available for viewing on the YouTube channel for The Invaders.